In an effort to keep from being overwhelmed by my outstanding 29 items, I’ve done some planning this weekend. 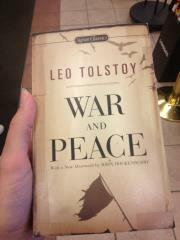 Did you know there are about 20 different translations of War & Peace? I read a lot of reviews and headed to Barnes. I went with the unabridged Dunnigan version. Hope I made the right choice! I found an optometrist whose website has recommendations from local artists/musicians, so hopefully I’m cool enough to get an appointment. According to my new running app, one lap around the large loop in our neighborhood is exactly 1k. If I can build up to 5 loops, I’ll be able to run a 5k! Today I ran one (without stopping) and realized how out of shape my lungs are. Cooking class = scheduled! At the end of October I’ll be attending a Knife Skills class in Indy. I’ve always felt I’d be a better cook if I could figure out how to use knives correctly, so I’m excited about this one! I also decided where I’ll be rock climbing, zip-lining, seeing a fortune teller and taking a hip-hop dance class. It was a productive weekend!